How many types of plots are there? According to Christopher Booker’s ‘The Seven Basic Plots’ most stories can be categories under one of seven basic structures. For example, Jaws, Alien and Beowulf would all fall under the ‘Overcoming the Monster’ category. ‘Lord of the Rings’ and ‘Raiders of the Lost Ark’ fall under the ‘Quest’ category. Booker is not the only one to look at story structure. 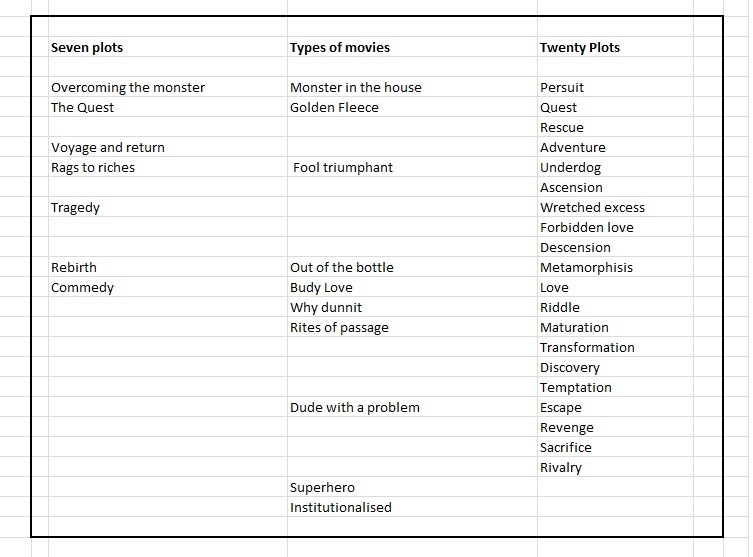 Ronald Tobias analyses stories by using twenty Master Plots. Some of these overlap with the seven basic plots. In the diagram I have tried to align them under the different categories although they do not necessarily easily fit. For example, Tobias examples of ‘Pursuit’ include ‘Jaws’, ‘Alien’, (which is close to the ‘Monster in the House’ category) but also ‘Narrow Margin’, ‘Bonnie and Clyde’ and ‘Butch Cassidy and the Sundance Kid’. Tobias is more detailed than Booker and looks more to the motivational aspects of the story. Blake Snyder in ‘Save the Cat’ also categorises movies according to ten different types. His ‘Golden Fleece’ category includes ‘Star Wars’, ‘Back to the Future’ and most heist movies. The ‘Dude with a problem’ category includes ordinary people with a problem: ‘Die Hard’, ‘Titanic’ and ‘Schinder’s List’. The ‘Superhero’ category includes exceptional people with a problem: ‘Gladiator’, ‘Frankenstein’, ‘Dracula’, ‘Superman’ etc. ‘Buddy Love’ includes ‘Rain Man’, ‘Dumb and Dumber’ as well as every love story ever made. ‘Institutionalised’ is about groups: ‘MASH’, ‘The Godfather’. The ‘Fool Triumphant’ includes ‘Dave’, ‘Forrest Gump’, ‘The Pink Panther’. Whydunnit’ includes ‘China Syndrome’, ‘All the President’s Men’ to every detective story ever told. ‘Out of the bottle’ includes ‘Bruce Almighty’, ‘Freaky Friday’, and ‘The Love Bug’. Of the three authors classification systems I tend to prefer Blake Snyder’s approach. It’s less detailed than the twenty plots of Ronald Tobias, but is in my view more intuitive. The only aspect that does not seem to fit easily into the structure are tragedies. But then again tragedies are not particularly popular at the box office. Why is story structure important? If we can understand why certain story structures work and others don’t we can analyse our own work to see if they contain the same pattern (or beats). The trick is to use the same winning pattern, but to be somehow different. Probably not all these at once; or at least not when you first met them at the start of the story. No one is perfect, and perfect lead characters are, well, frankly boring. Usually at the start of a good story the character has some flaw that they will need to overcome to fulfil themselves, and reach the story goal. The hero might be reckless, or arrogant, or juvenile; the heroine might be self-centred, weak or easily led. They need to learn what’s important during the course of the story. This is character arc: the change a character goes through in the course of the story. Think of Hans Solo the arrogant space pirate that only thinks of himself. Except of course at the end where he comes to the aid of Luke Skywalker. Think of Luke Skywalker and his development from a farm boy to Jedi knight. In some cases, we may only see the lead character’s true self when he/she is finally put to the test during the later stages of the story. There may well be glimpses of the true character during the course of the story; but it is only in the final test do we discover who they really are. Not all main characters necessarily change. James Bond, John McClane, Jack Reacher, Harry Potter, Robert Langdon are all pretty much the same character from story to story. Serial stories may therefore be the exception as the story has to continue beyond the current storyline. In other cases, it might not be the lead character that changes; but someone else close to the character. In “Back to the Future” (one of my all-time favourite movies), it is Marty’s father that changes. There are therefore no rules about character arc. In my previous blog, I wrote about how character and plot are interwoven. Character is revealed by the actions the lead character makes. Blake Snyder, in ‘Save the Cat’, talks about the importance of the ‘save the cat’ scene. He says it’s a scene at the beginning of the movie where the hero does something small – like saving a cat – that defines who he is and makes the audience like him. Snyder says this scene is less common in movies these days. He quotes the example of Lara Croft 2, which in spite of a big budget didn’t resonate at the box office. His explanation was that the Lara Croft character, although ‘cool’, was ‘cold and humourless’. What she needed to do was something kind – a ‘save the cat’ scene. Perhaps a good example of actually ‘saving the cat’ is the scene from Alien, where Ripley goes back to save the ship’s cat. Although the scene is at the end of the movie it has a similar effect. Ripley has a heart after all. In Aliens 2, she goes on better trying to save a little girl. Other more dramatic examples might be Katniss’s action to volunteer for the Hunger Games to save her younger sister. (That pretty much trumps saving a mere moggy). Heros and heroines are not defined by how they look or what they say. They are defined by the heroic actions they carry out. Some of these actions might be quite small at the start of the story, but they give us a glimpse of what is to come. So what type of stories do you write: character-driven or action-driven? When thinking about your story ideas, do you start by imagining an interesting character, or do you start with some interesting ‘what if’ events and then consider the character? It doesn’t really matter where you start, but you need both character and plot to make an interesting story. They are inseparable. How is a character going to reveal his character – only by how he/she responds to events, and by the decisions he/she takes which in turn affects future events. Plot and character are intertwined. A great character with nothing to do doesn’t make an interesting story. Jack Reacher or James Bond without bad guys to go after is a pretty boring story. A series of events, like World War II doesn’t make a story. A story about a group of soldiers in a particular action in World War II and how they react in a particular situation may well be a great story. The chemistry between character and plot is one of the key ingredients of a story. They must fit snugly together. Take the Hunger Games – a brutal plot where children are put into an arena to kill each other, and Katnis a strong willed heroine who volunteers to take her sister’s place in the arena. The story wouldn’t have worked without her. What if Brigette Jones was playing the lead in Hunger Games instead? It wouldn’t work. Putting it another way – the characteristics of the lead character are defined by the requirements of the plot. The same is true in stories that are not action orientated. Katnis wouldn’t have made a great lead in Briget Jones’ Diaries, or Never Been Kissed. Would Erin Brockovich been the same without the feisty character played by Julia Roberts? The problem with many ‘how to’ books on writing (and I’ve read a lot) is that they look at the writing process as something that can be broken down into components that can be studied separately: character, plot, descriptions, dialogue etc. Don’t get me wrong, I’ve learnt a lot from these books, particularly about avoiding those basic newbie mistakes. But there are some aspects of writing that come down to pure chemistry: and plot and character are two important components. You know when you’ve got it right; and you know when it doesn’t work. But it’s hard to put your finger on it. It’s called ‘chemistry’. What makes a good story ending? Having covered story beginnings and middles in previous blogs, it seems only natural to cover story endings. Whether a story ending is right or not can ultimately only be judged by the reader. If the ending is not consistent with the direction the story is taking the reader, they may well feel disappointed and let down. After all, the reader has invested his time, and emotional energy in the characters of the story. So what makes a story ending consistent with the direction of the story? Ultimately it depends on the type of story and the expectation it generates about the ending. That isn’t to say the author can’t surprise the reader with an ending (a twist); but the twist ending should be consistent with the type of ending the reader expects. In Christopher Booker’s ‘The Seven Basic Plots’, Booker discusses a ‘universal plot’ in which the conflict in any story revolves around a component of human nature symbolised by a ‘dark power’. How the hero/heroine responds to the ‘dark power’ determines the outcome of the story. In the beginning of the story a hero or heroine is in some way undeveloped, frustrated or incomplete. In the middle of the story they fall under the shadow of some ‘dark power’. The ending depends on whether the hero learns to overcome his weakness, defeat the ‘dark power’ and reach his goal (positive ending); or whether he fails to change and ends in his own destruction (negative ending). Thus the universal plot is based on moral sense of justice. The universal plot is easy to identify in many of the tragedies of Shakespeare: Hamlet, Othello, King Lear, Macbeth. These were basically noble men whose tragic flaws led to their own destruction. Tragedies are less popular today, as Hollywood seems to have a preference for positive endings. In the positive ending, the hero overcomes his weaknesses, defeats the antagonist and achieves his goal, even if the rest of the cast die in the process (e.g. Alien). Those movies that I have seen with depressing endings I have found disappointing. Most tanked at the box office (at least Hollywood understands money). Personally, I want to see endings that show the triumph of the human spirit over adversity. That doesn’t necessarily mean that the ending has to be ‘happy’. It may well be sad if that’s what fits the storyline. For example, in Space Cowboys (2000) Corvin and Hawkins discover that the Soviet Communications satellite that is about to come out of orbit has six nuclear missiles onboard. To stop the missiles re-entering the rockets have to be fired manually. Hawkins fires the rockets and takes them to the moon. He saves the world and achieves his wish of going to the moon, only to die on the moon’s surface. Not exactly a ‘happy ending’, but a sad one, and the right one for the movie. An author has to have a good beginning, a good middle and a good end to his story to satisfy his reader. A bad opening and the reader will not pick the book up. A bad middle and the reader will put the book down in the middle. A bad ending and he/she probably won’t look at a book from the same author again.